Once again the setting is perfect for showing off your quilt. It looks so cozy, and the quilting complements the blocks nicely. Don’t you love it when everything comes together so well? If you can, post a picture on the bed when you get to Downieville. I’ve been working on a fast quilt this week and practicing letting go with random color arrangement. A real departure from my usual ways. Have a happy Valentine’s weekend! Big and beautiful. Love your color/fabric choices. Congratulations! I hope you have a great afternoon of sewing, too. I’m finally getting around to quilting my Midnight Mystery quilt. I hope to get it done before I head to QuiltCon early next week… we’ll see! Huge quilt you must be pleased that it is done. It’s lovely. That sounds like a cute project Colleen. Sometimes I see the prettiest panels but cannot decide what I would do with them. You are so right on the weather! I love these sunny days but yes, we need a lot more winter! It’s beautiful ; congrats on the finish ! Yes, it is a big one! It. It is an extra long twin size-that is part of the reasoning for the straight line quilting. Easier than moving it around for FMQ. I am so happy with it though. Now I need to make the second one! Enjoy your weekend. Oh my gosh! I love it! You did goooood. 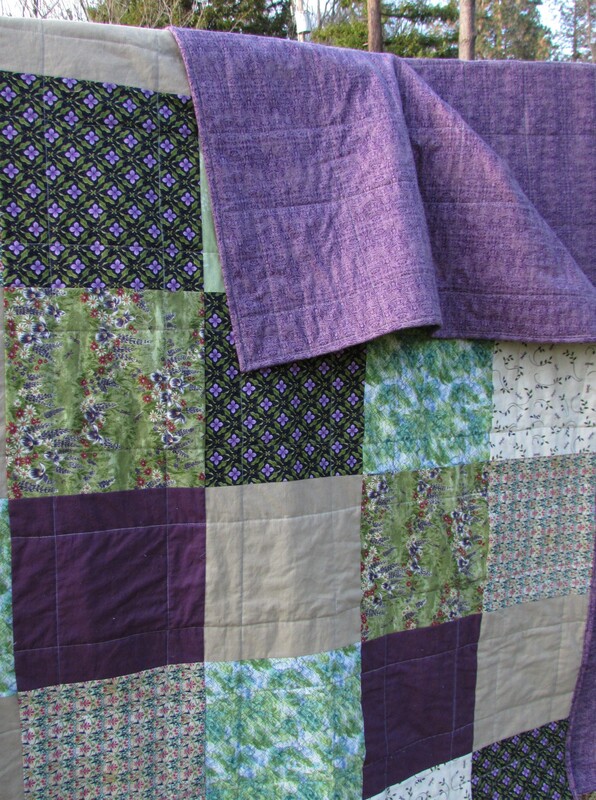 I love the big blocks, the colors (especially the purple), AND Julia chose well on the backing – it’s perf! Downieville. Sigh. It’s like, the ideal town. Do you take pics at your guild meeting? Would love to see them. On a humorous note, when I first saw “a quilt that will live in a house along the river, in the mountains”, my mind immediately went to Chris Farley’s “livin’ in a van, down by the river” motivational speech on Saturday Night Live. That is always a funny thing… Stream of consciousness- what leads to the next thought. Oh….. Chris Farley! It is a nice color palette. I am looking forward to making the second one, though I might change up the pattern. What do you think? If it is all the same fabrics, old it be best to make the second one exactly the same? It r choose a new layout? 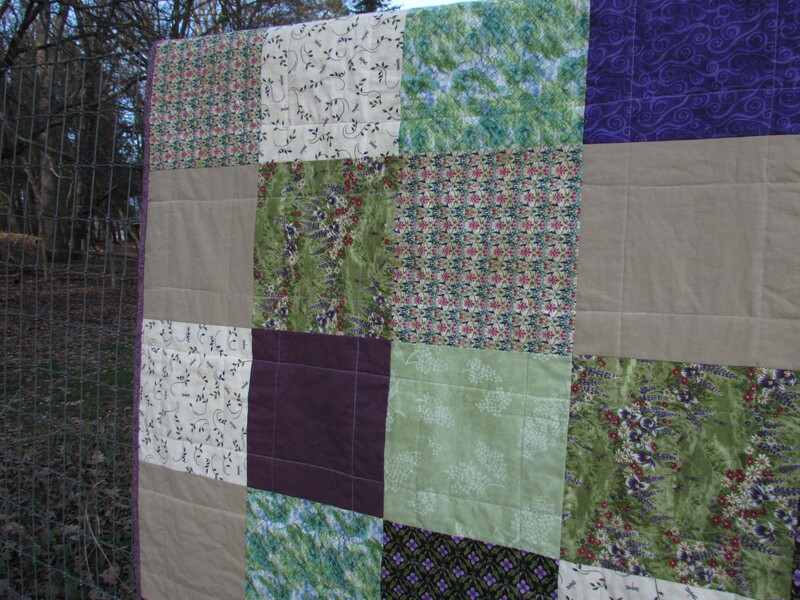 I was thinking of big, blocky rail fence blocks, or an ‘oversized’ stacked coins quilt? I’m trying to pick fabrics for a prayer quilt for my niece – she just had a mastectomy. 🙁 I’m leaning towards a cross quilt – I think it’s usually referred to as a “plus” quilt. Your quilt is quite lovely; I worked on little things this week. Very beautiful! Thanks Penny. I actually enjoy working on small projects. It is gratifying to start and finish something rather quickly! Thank you. 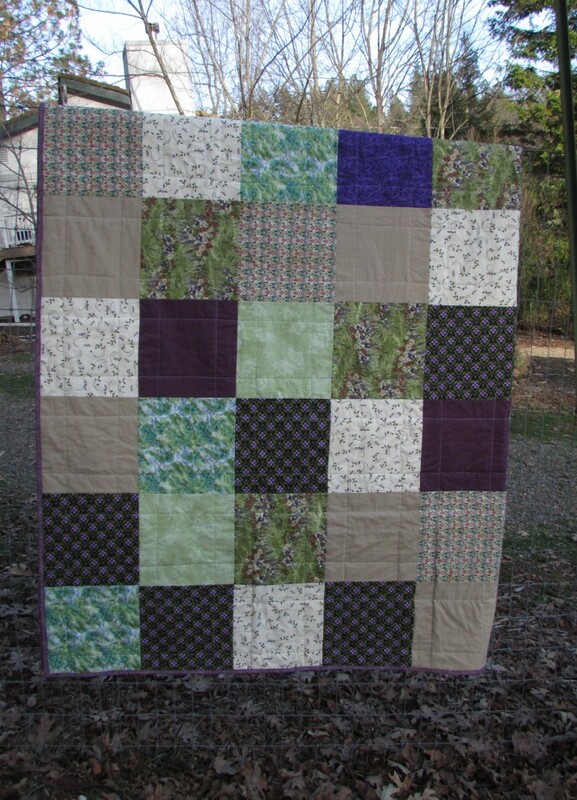 I love traditional patchwork, all sizes of squares! !